It's simple: you will wear your jewelry more often when you see it. If it's exposed, it's easy to grab and toss on. This is a no-brainer. But how does one have the space to do such a thing? I wanted to have easy access to (and appreciate) all of my pretty finds, so I came up with this little corner. It's like my own private jewelry store! This used to be a wasted little space behind our bedroom door that I never really knew what to do with. Then a few years back I decided to try out a peg board. It really has changed the way I pick my accessories in the morning as well as my ability to switch things up seasonally. You might be wondering where the boots and gym shoes are. Mostly in the closet lined up on the floor and lined up under the bed as well. Purses and clothes are for another post altogether; if you are interested in that let me know in the comments! 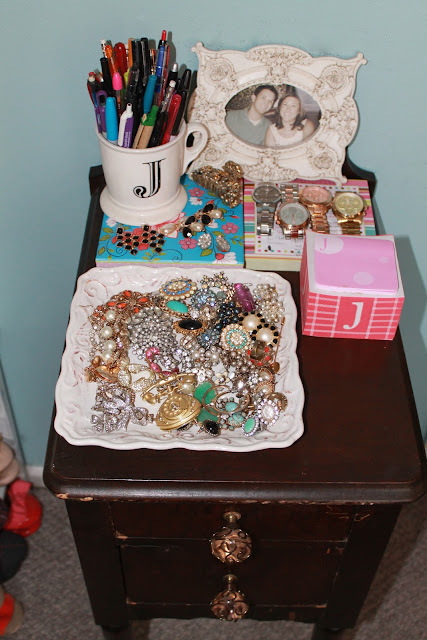 First glance at my jewelry nook. Buy your own at Home Depot and spray paint to the color of your liking. 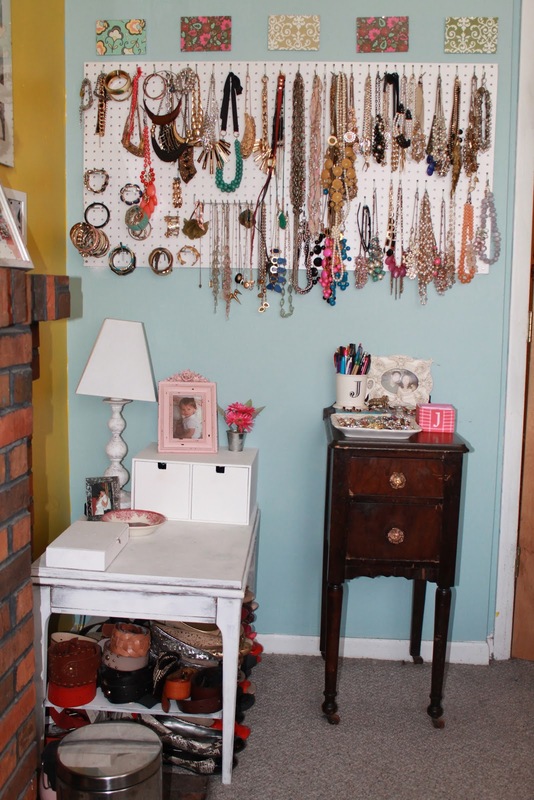 Then buy various peg board hooks to hang your jewels. The whole project cost me about 25 bucks. Also Home Depot will cut the board for you to whatever size you need! Above the board are some cheap Ikea frames holding bits of leftover Paper Source paper. 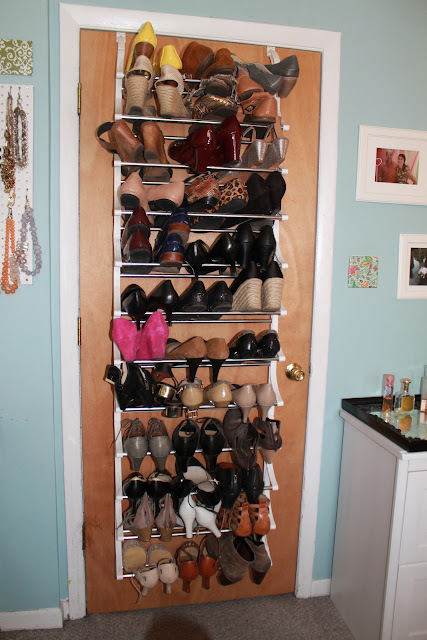 This is where the high-wear rotation shoes live, behind the bedroom door. Things get a little dusty from the constant open exposure so I keep swiffer rags tucked inside a shoe for quick touch-ups. Perfume is on the mirrored tray to the right which is placed there strategically so that as I leave I remember to put on perfume right before I go. Some flats and thick belts hide under a table I found in the trash and whitewashed. The white box has lesser-worn earrings in it. Skinny belts are in a drawer across the room. You can see the attachment with the horizontal "arm" is great for storing bracelets. This little rolling chest was my grandmother's. My dad thought it looked like junk but I convinced him it was worth keeping. I loved all the scuffs and character it had. I got some new knobs from Anthropologie and it turned out even better than it started! This tray stays next to my bed so that when I take off my studs at night I won't lose them. And here is the best part: I close the door and it all just disappears. Like a hidden jewelry store in my own home! Hope this helps you come up with some organizational ideas of your own! I LOVE this post Jill! I need a wall to hang all my necklaces like that - I love that. Then you can see what you have all at once! Glad you like it! It was all your idea! Let me know what other curiosities you might have about my storage! Happy to share!